Citation: Rouse J, Haller CF, Vande Hei AG, Thomas DM (2018) Rituximab Associated Non-Atherosclerotic Spontaneous Coronary Artery Dissection. 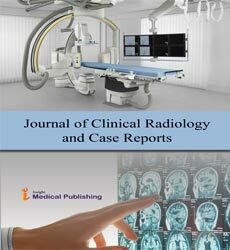 J Clin Radiol Case Rep. Vol.2 No.1:05. Copyright: © 2018 , et al. This is an open-access article distributed under the terms of the Creative Commons Attribution License, which permits unrestricted use, distribution, and reproduction in any medium, provided the original author and source are credited. Non-atherosclerotic spontaneous coronary artery dissection (NA-SCAD) is a rare cause of acute coronary syndrome (ACS) in men. Idiopathic NA-SCAD has an estimated incidence at 1 in 200,000 cases of acute coronary syndrome . A majority of cases of NA-SCAD are linked to a precipitating factor, which includes such entities as fibromuscular dysplasia, connective tissue disease, systemic inflammatory illness, physical exertion, emotional stress, and recreational drug use . Spontaneous coronary artery dissection (SCAD) is a rare cause of acute coronary syndrome (ACS) with a reported incidence of 0.1 to 0.4 percent of cases [2,3]. Certain disease states, including fibromuscular dysplasia (FMD), connective tissue disorders, systemic inflammatory conditions, and postpartum status, have been identified as potential predisposing factors . SCAD is subdivided based on association with or without atherosclerotic coronary artery disease. Atherosclerotic SCAD, representing the majority of SCAD cases, presents as a focal dissection with limited propagation at areas of atherosclerotic plaque with pathologic hallmarks of medial atrophy and scarring . Nonatherosclerotic SCAD (NA-SCAD) involves intimal tearing with or without intimal hemorrhage in the absence of coronary atherosclerosis . NA-SCAD is poorly described in men, as greater than 90% of cases affect women. One retrospective cohort involving 288 subjects with NA-SCAD, 8.7% of whom were men, identified precipitating factors for NA-SCAD. These factors, reported in 72% of men with NA-SCAD, included isometric exertion, heavy lifting, emotional stressors, and fibromuscular dysplasia. Only 16% of patients in this cohort were considered to have idiopathic SCAD . In an attempt to better define this idiopathic SCAD subtype, a possible correlation between use of rituximab and SCAD has been suggested. Rituximab is a monoclonal antibody that binds to B-cell CD20 receptors and is commonly used in the treatment of non-Hodgkin lymphomas. In a variety of published case reports, rituximab-induced coronary artery vasospasm [7,8] or rituximab-induced acute coronary syndrome [9-12] have been described, many in patients with no coronary artery disease risk factors. One case report describes a patient who experienced ACS identified as SCAD, with symptom onset 15 minutes following rituximab administration . This report, along with the case described below, adds to the discussion of possible association of rituximab with cardiac pathology. A 50-year-old man with no CAD risk factors or cardiac disease presented with sudden onset of severe substernal chest pressure and associated dyspnea while walking down stairs. The chest pain improved with rest. He denied previous chest pain episodes. He also denied precipitating emotional stress, physical exertion, or recreational drug use. Initial electrocardiogram while symptomatic (Figure 1) was significant for ischemia. Initial troponin T was elevated at 0.120 ng/dL (ref 0.000-0.010) consistent with a diagnosis of non-ST segment elevation acute coronary syndrome (NSTEACS). Subsequent transthoracic echocardiogram revealed hypokinesis of the apical anterior and apical septal wall segments. He was treated with dual-antiplatelet therapy and intravenous unfractionated heparin with plan for invasive coronary angiography (ICA). Figure 1: Electrocardiogram when patient was experiencing angina. Of note, his medical history was significant for stage IV follicular lymphoma, which was currently stable following completion of 6 cycles of bendamustine/rituximab combination therapy. He is currently receiving rituximab maintenance therapy with last dose 1 month prior to presentation. Serial troponin T measurement peaked at 0.952 (ref. 0.000-0.010 ng/dL) before down trending. Unfortunately, no creatine kinase (CK) levels were collected. ICA performed within 24 hours of symptom onset (Figure 2) was significant for a >20 mm segment of luminal narrowing without evidence of atherosclerotic plaque involving the distal left-anterior descending artery (LAD). This lesion did not improve with administration of 200 mcg of intracoronary nitroglycerin. Given the angiographic size of the lesion, absence of coronary atherosclerosis, and failure to improve with vasodilators, diagnosis of NA-SCAD was made. Given distal location and vessel size, further invasive interrogation with intravascular ultrasound (IVUS) or optical coherence tomography (OCT) was deferred. Per the interventional cardiologist, the location and vessel size made percutaneous intervention (PCI) difficult, and the decision was made to treat the NA-SCAD conservatively. 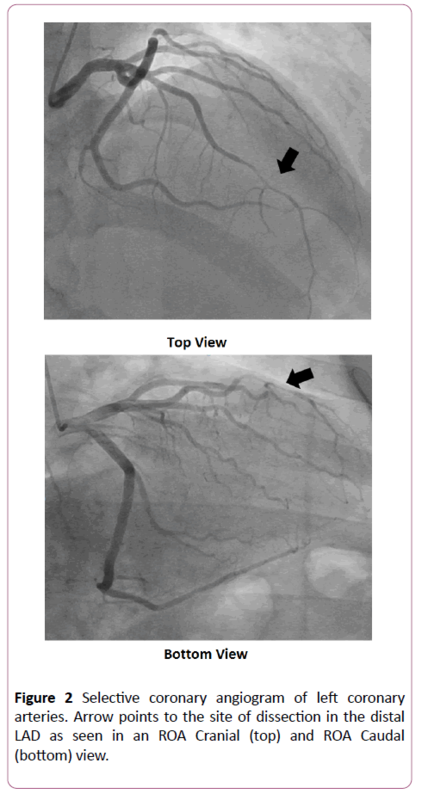 Figure 2: Selective coronary angiogram of left coronary arteries. Arrow points to the site of dissection in the distal LAD as seen in an ROA Cranial (top) and ROA Caudal (bottom) view. The diagnosis of NA-SCAD was made based on the lesion characteristics on ICA and the lack of response to intracoronary nitroglycerin in the absence of coronary atherosclerosis. However, due to lack of either IVUS or OCT, definitive diagnosis of SCAD was not achieved. The differential diagnosis for precipitating factors contributing to NA-SCAD included idiopathic SCAD, FMD, connective tissue disease, systemic inflammatory disease. Recreational drug use, physical stress, and emotional stress had been excluded on the basis of reported history and urinary drug testing. The patient was discharged with isosorbide mononitrate and carvedilol for blood pressure control as well as low-dose aspirin. Subsequent outpatient follow-up demonstrated preserved systolic function on repeat TTE and resolution of symptoms. He was referred to rheumatology for further assessment without evidence of connective tissue disease or systemic inflammatory illness. CT angiography of the head, neck, and abdominal vasculature was negative for FMD or other vasculopathies. Of note, rituximab maintenance therapy was continued by oncology. At a 2 month follow up, the patient denied any further episodes of chest pain and remained physically active. Subsequent imaging with contrast-enhanced cardiac MRI (CMR) was performed revealing subendocardial gadolinium enhancement involving 50-75% of the mid to apical anterior/ anteroseptal wall segments consistent with myocardial infarction in the LAD territory (Figure 3). Figure 3: 2-chamber image showing delayed subendocardial gadolinium enhancement (white arrow) involving 50-75% of the mid-apical anterior/anteroseptal walls and extending to the apical cap consistent with myocardial infarction. SCAD is a poorly understood cause of ACS, particularly in men. This case report details an occurrence of rituximabassociated NA-SCAD in a male patient as a potential contributing factor to what would otherwise be described as idiopathic NA-SCAD a phenomenon with an incidence of 1% of NA-SCAD presentations and approximately 1 of 200,000 ACS events . Rituximab has documented cardiac side effects to include cardiac arrhythmias and acute coronary syndrome, with the later reported as occurring in <0.1% of patients receiving rituximab . Several case reports have detailed possible association between rituximab and ACS via vasospasm [7,8] or other cause [9-12]. Many of these patients were without cardiac risk factors prior to the event. The mechanism of cardiac ischemia secondary to rituximab is unknown but has previously been hypothesized to be cytokine-mediated rupture of intracoronary atherosclerotic plaque . The association of rituximab and NA-SCAD was previously reported in a single case study by Arunprasath et al. . While a definitive diagnosis of NA-SCAD was not established in this case due to the lack of IVUS or OCT data, this conclusion is supported by ICA features and CCMR findings. The causal relationship between rituximab and NA-SCAD is limited by the temporal delay between the last dosing and patients ACS presentation. The patient was more than 1 month from his last rituximab infusion, whereas a majority of reported cases involved onset of symptoms shortly after or during rituximab infusion [9-13]. Our workup for other known causes of NAJournal SCAD was comprehensive, but did not utilize genetic testing or imaging of the iliac arteries. Thus, there is a very small chance that underlying FMD or other CTD was not identified. This case represents the latent onset rituximab-associated NA-SCAD in a male. This case provides an additional data point in the ongoing documentation of association between cardiovascular system and rituximab therapy. The view(s) expressed herein are those of the author(s) and do not reflect the official policy or position of Brooke Army Medical Center, the U.S. Army Medical Department, the U.S. Army Office of the Surgeon General, the Department of the Army, the Department of the Air Force and Department of Defense or the U.S. Government. Saw J, Ricci D, Starovoytov A, Fox R, Buller CE (2013) Spontaneous coronary artery dissection: prevalence of predisposing conditions including fibromuscular dysplasia in a tertiary center cohort. JACC Cardiovasc Interv 6: 44-52. Mortensen KH, Thuesen L, Kristensen IB, Christiansen EH (2009) Spontaneous coronary artery dissection: a Western Denmark Heart Registry study. Catheter Cardiovasc Interv 74: 710-717. Nishiguchi T, Tanaka A, Ozaki Y, Taruya A, Fukuda S, et al. (2016) Prevalence of spontaneous coronary artery dissection in patients with acute coronary syndrome. Eur Heart J Acute Cardiovasc Care 5: 263-270. Saw J, Aymong E, Sedlak T, Buller CE, Starovoytov A, et al. (2014) Spontaneous coronary artery dissection: association with predisposing arteriopathies and precipitating stressors and cardiovascular outcomes. Circ Cardiovasc Interv 7: 645-655. Isner JM, Donaldson RF, Fortin AH, Tischler A, Clarke RH (1986) Attenuation of the media of coronary arteries in advanced atherosclerosis. Am J Cardiol 58: 937-939. Alfonso F (2012) Spontaneous coronary artery dissection: New insights from the tip of the iceberg? Circulation 126: 667-670. Ke C, Khosla A, Davis MK, Hague C, Toma M (2015) A case of coronary vasospasm after repeat rituximab infusion. Case Rep Cardiol 2015: 1-3. Lee L, Kukreti V (2012) Rituximab-induced coronary vasospasm. Case Rep Hematol 2012: 1-3. Armitage JD, Montero C, Benner A, Armitage JO, Bociek G (2008) Acute Coronary Syndromes Complicating the First Infusion of Rituximab. Clinical Lymphoma and Myeloma 8: 253-255. Keswani AN, Williams C, Fuloria J, Polin NM, Jahangir E (2015) Rituximab-Induced Acute ST Elevation Myocardial Infarction. Ochsner J 15: 187-190. Mehrpooya M, Vaseghi G, Eshraghi A, Eslami N (2016) Delayed Myocardial Infarction Associated With Rituximab Infusion: A Case Report and Literature Review. Am J Ther 23: e283-e287. Sharif K, Watad A, Bragazzi NL, Asher E, Abu Much A, et al. (2017) Anterior ST-elevation myocardial infarction induced by rituximab infusion: A case report and review of the literature. J Clin Pharm Ther 42: 356-362. Arunprasath P, Dubashi B, Balachander J, Gobu P, Satheesh S (2011) Rituximab induced myocardial infarction: A fatal drug reaction. J Can Res Ther 7: 346-348. Roy A, Khanna N, Senguttuvan NB (2014) R ituximab-vincristine chemotherapy-induced acute anterior wall myocardial infarction with cardiogenic shock. Tex Heart Inst J 41: 80-82.